By the mid-2000s, the automotive industry had officially entered a new era. 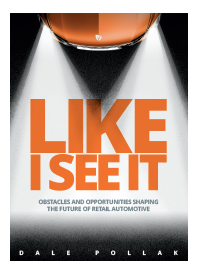 Consumers were armed with new depths of information, and demanded more transparency from dealers, who struggled to maintain the levels of success they were used to — particularly in the used car business. vAuto quickly emerged as the solution. After you have taken a Cialis pill, you can safely drive a car or do other work requiring attention because the drug does not affect the cognitive functions of the body. Founded in 2005 by a group of automotive industry veterans determined to provide dealers with a new way to manage their used vehicle inventory, vAuto launched groundbreaking technologies that empowered dealers to improve their used car profitability and turn rates, even in a new era. Built on thought leadership from founder and industry visionary Dale Pollak, vAuto’s technologies delivered real-time supply-and-demand metrics in software tools that seamlessly applied Velocity® principles to its customers’ used vehicle operations. In late 2010, when vAuto was acquired by AutoTrader Group, the company gained one-of-a-kind access to data from AutoTrader.com® and Manheim, the nation’s premier retail and wholesale marketplaces. This affiliation drove the development of vAuto’s game-changing Provision Suite of used vehicle inventory management tools. The Provision system provides unparalleled insights into consumer demand and wholesale availability to help dealers identify, source and retail the “right” used vehicles in a more efficient and profit-focused manner. Today, vAuto’s Provision system offers dealers the best, most comprehensive used vehicle market data and inventory management decision-making insights in the industry. In 2012, vAuto launched the vAuto Genius Labs product line — smart, simple, stand-alone tools that solve everyday challenges for every kind of dealer. The product line launched with the acquisition of AuctionGenius®, from automotive entrepreneurs Todd Kinzle and Kyle Himmerick, and has since grown to include the Kelley Blue Book® Price Advisor Report, a tool that helps dealers bring Kelley Blue Book’s trust to their used vehicle listings. In 2014, vAuto expanded beyond used vehicle management with the introduction of Conquest, the industry’s first new car inventory management and pricing software of its kind. Built on new thought leadership from Pollak, Conquest challenged dealers to leave their old new car thinking behind and embrace new directives that lead to greater volume and profitability — from advanced stocking and pricing strategies to an innovative approach to managing incentives. Today, many of the country’s most successful dealerships use vAuto’s new and used car products to stay ahead of competitors and maximize results. Since its inception, vAuto has been committed to providing ongoing training, proactive coaching and 24/7 support to ensure dealers achieve results they never thought possible. vAuto couples its premier software solutions with industry standard–setting Performance Management for dealer clients. Each dealer has a dedicated Performance Manager to help run Provision® and Conquest to their fullest potential. vAuto’s visionary founder, Dale Pollak, has published several books on his Velocity Method of Management™, and remains one of the leading authorities on automotive dealership management strategies. Pollak guides strategic product development and integration for vAuto as well as other AutoTrader Group companies. vAuto is headquartered in Oakbrook Terrace, Illinois, and vAuto Genius Labs is headquartered in Longmont, Colorado. vAuto maintains research and development facilities in Austin, Texas. My first tool used for merchandising, pricing, appriaising, and stocking was Vauto. What an eye opener and what a great tool. And to Dale what an excellent book. All that I can say is Thank you.. it's made me a leader in the industry. Your “Red Wagon” app on iTunes for the iPhone/iPad should state that you can't use any functions of the application without a log on and password obtained from another site, and at what cost. You lost my interest with the dishonest approach. Recently, in Febuary I beacame the used car manager at a Toyota store. Previously I was a sales manager and got a promotion as I have been here for 3 and a half years and had some success desking and closing deals and overlooking finance and the sales consultants. I was excited about the new challenge and needed some insight as I have never managed a used car department. In March I got a chance to go to a seminar which was hosted by Dale Pollack and Bill Reidy on Vauto. My GM and I decided after the seminar to move ahead and purchase the system. The results are fantastic. We went from 3 to 1 new to used to about 1 to 1. Since the purchase I have a mentor, Dave Rinaldi, who has conference calls with me and helps manage my inventory. We are currently turning our retail inventory 16.8 times a year as compared to 8 in the past. The results were immediate. Our average days in inventory went from 48 down to 22. And get this OUR GROSS per unit stayed the same on double the units! Velocity is the only way to be in the used car business today. Thank you Dave for all your help and lets keep improving. Thanks Dale for your presentation and product and I'm still waiting for you to come to our store as per our conversation in March! Wow, congratulations. Your success is phenomenal. I think that the fact that you assumed the position of UCM and found the Velocity Method of Management about the same time, speaks volumes about your success. In other words, there is very little about used car management that you had to unlearn and let loose of. Your story serves as an inspiration to both me and others. Keep up the great work and please forgive me for not yet visiting. I'll ask my assistant, Susan to reach out to you and see if we can't find a time that works. Thanks, and again, congratulations. Recently, in Febuary I beacame the used car manager at a Toyota store. Previously I was a sales manager and got a promotion as I have been here for 3 and a half years and had some success desking and closing deals and overlooking finance and the sales consultants. I was excited about the new challenge and needed some insight as I have never managed a used car department. In March I got a chance to go to a seminar which was hosted by Dale Pollack and Bill Reidy on Vauto. My GM and I decided after the seminar to move ahead and purchase the system. The results are fantastic. We went from 3 to 1 new to used to about 1 to 1. Since the purchase I have a mentor, Dave Rinaldi, who has conference calls with me and helps manage my inventory. We are currently turning our retail inventory 16.8 times a year as compared to 8 in the past. The results were immediate. Our average days in inventory went from 48 down to 22. And get this OUR GROSS per unit stayed the same on double the units! Velocity is the only way to be in the used car business today. Thank you Dave for all your help and lets keep improving. Thanks Dale for your presentation and product and I’m still waiting for you to come to our store as per our conversation in March! Wow, congratulations. Your success is phenomenal. I think that the fact that you assumed the position of UCM and found the Velocity Method of Management about the same time, speaks volumes about your success. In other words, there is very little about used car management that you had to unlearn and let loose of. Your story serves as an inspiration to both me and others. Keep up the great work and please forgive me for not yet visiting. I’ll ask my assistant, Susan to reach out to you and see if we can’t find a time that works. Thanks, and again, congratulations. What is the red wagon app? Like the Vauto app but for none vauto customers? Thanks for your question. Red Wagon is a mobile application that we developed for small, independent and wholesale dealers. It provides the essential tools for pricing, appraising and stocking, but it is only available on a mobile platform (i.e. iPhone and Android). It’s really slick and seems to meet the needs of a small operation. Let me know if you’d like to see a demo. My name is Paul and I own a 80 car independent Dealership in North Jersey. Can I get the same help from the red wagon app as I would from Vauto? Do you think Vauto may be over kill for a small dealership like mine? Thanks for the question. First, let me say that I don’t think that an 80 car dealership is small. In fact, it’s probably the size of a typical vAuto client. The real question however is how many of the 80 you’re selling each month. With much effort using the Velocity Method of Management, you should be selling 80 – 100 per month. We have many independent dealerships performing at this rate. If you’re committed to learn and implement the Velocity strategy, the vAuto software and its associated costs will definitely more than pay for itself. If however you’re inclined to be a bit more casual and laid back in your approach, then the lower priced Red Wagon system would probably be a better choice. The Red Wagon solution is only mobile, and it does not have the vAuto Performance Management relationship component. Essentially it gives a dealer access to knowledge and understanding about their marketplace, but does not promote any specific performance objectives. If you’d like to know more, please feel free to call me, and again, thank you for your interest in vAuto. Thanks so much for the advice. I’ll work hard to do a better job. this in fact lowering the market artificially? Thanks so much for the question, and I would encourage you to always challenge ideas and approaches. I don’t think that anyone should accuse vAuto of driving down prices, because vAuto makes absolutely no recommendations as to where dealers should price. vAuto only reports to dealers the marketplace as seen by consumers on the internet. It is the dealer’s sole decision without guidance from vAuto as to where to price vehicles. Now, if you mean that providing dealers with such tools does in fact give them the ability to see the competition and price lower, that’s a different question. You should not, however, be angry with vAuto, because if it wasn’t us, it would be somebody else. vAuto however, provides not just software, but also philosophy and methodology as to how to operate competitively, responsibly and profitably. If you and others read any of my books, Velocity: From the Front Line to the Bottom Line; and Velocity 2.0: Paint, Pixels and Profitability, you will see how much we emphasize that capturing customers is not a game of pricing the lowest. Having a competitive price is important, but it’s not about having the lowest price. Rather, it is about creating and maintaining certain conditions of your inventory like market day’s supply, cost to market and price to market along with certain conditions of on-line merchandising. When and only if all of the these factors exist in proper form and balance, can a dealer expect to achieve Velocity success. Personally, as a dealer’s son, dealership owner and industry software provider, I owe everything to dealers. No one is more uncomfortable than I am when dealers use low price alone as the means to achieve success. I work tirelessly with dealers, both vAuto and non-vAuto clients to help them understand the means to be more successful. This is my passion and who I am. Please let me know your thoughts. I need to comment here even though this post is 2 years old. The point of the program is not to own 100% of shoppers or access 100% of the used vehicle data online. The point is that, even utilizing only part of the web, dealers are able to get MORE customer eyeballs on their inventory and, with good processes and people, sell more vehicles. Its not about calculating/factoring the complete set of all used car inventory online. Its about having a big enough set to compare and competitively price vehicles. When this happens, miraculously, customers show up at your showroom or in your virtual showroom. There is so much more to the program than data sets anyway. Information that can be used to make decisions on purchasing, accessing inventory, grading your inventory etc. And competitive information. Vauto is not a perfect program. But its damn close. Look forward to find out if vAuto can assist our Retail dealerships in South Africa. Interesting. Please feel free to give me a call, or email me directly. [email protected], 630-343-9016.